What if New York's Central Park was in Wichita, KS? | ed. tech. for. me. 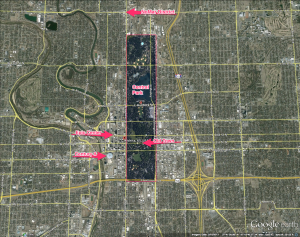 What if New York’s Central Park was actually in Wichita, Kansas? How big is New York’s Central Park, really? If you’ve ever been there, it’s quite impressive–you can spend hours walking trails only to see on a map later that you only covered a very small portion of the park. I wanted to put things in perspective, so I used Google Earth to measure and take a screenshot of Central Park. It turns out that it is roughly 2.57 miles long and .54 miles wide (Wikipedia reports roughly the same size). I then placed that image in central Wichita, Kansas to see how big it really is. 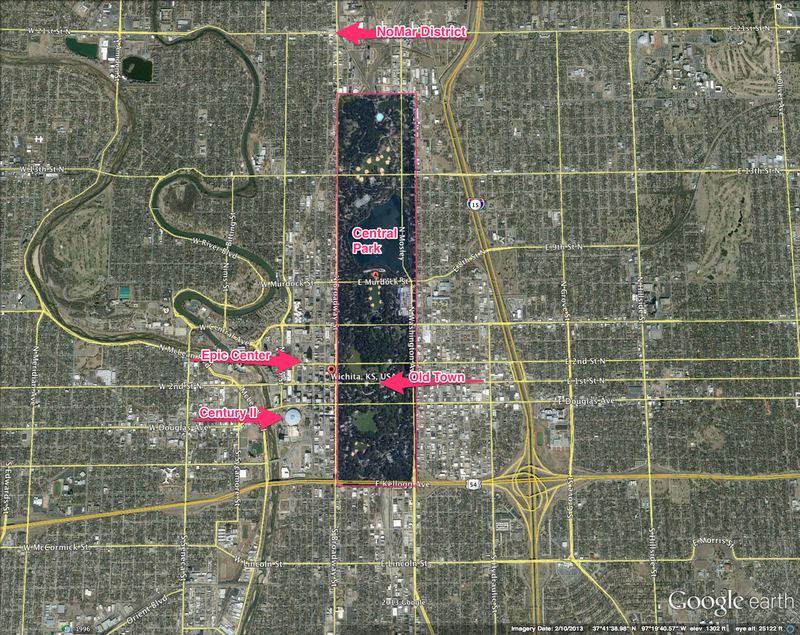 Central Park, super-imposed on Wichita, Kansas. Imagery copyright ©Google, 2014. Photo Illustration by Ryan Corcoran, cc-By-SA. I placed the southwest corner of Central Park at the intersection of Kellogg & Broadway (the old highway 81). That puts the eastern border of the park just past Washington Ave., and the northern border between 17th & 18th streets (the southeastern tip of the new NoMar district). Click on the image at left to see the full-size image of the map. Activities like this engage students’ higher-order thinking skills and puts geography in a “real-world” context. The Great Pyramids at Giza seem like something out of a history textbook, but you could ask your students to plop the 3D model of Khufu’s monument right next to Century-II to get a sense of scale. If you haven’t already seen it, also take a look at my downloadable Google Earth “tour” of the Santa Fe Trail. What are some other uses of Google Earth that you might find to engage your students at a deeper level?